Grilled trout is one of those dishes that resonates with anyone who’s ever caught one — or, really, anyone who even lives in Trout Country, which tends to be the colder places of this world. Grilling a trout or kokanee over an open fire is the natural end to a day spent in a beautiful place, where cold, clean water flows and the pines whisper to you as you cast and retrieve, cast and retrieve. I had the opportunity to spend just such a day recently with my friend Joel and his two boys, at a little High Sierra lake somewhat higher than 7400 feet. The lake, ringed with pines, is at the end of a kidney-jarring dirt road nearly five miles long. I’d love to wax rhapsodic about how fierce and wild these trout were, but alas, I am about 90 percent certain they are stocked rainbow trout, put there by California’s Dept. of Fish & Wildlife. Big deal. I was fishing with Joel and his boys, who are little and just learning to fish. Taking a kid fishing is both a lesson in patience and one of the more supremely gratifying things you can do: The look on their faces when they actually land a wriggling rainbow can’t be bought at any price. It’s one of a precious few things that evokes a paternal instinct in me. At any rate, it was a lovely, relaxing day, where everyone caught some fish to take home. I knew from the get-go that I’d be grilling these little mountain trout. 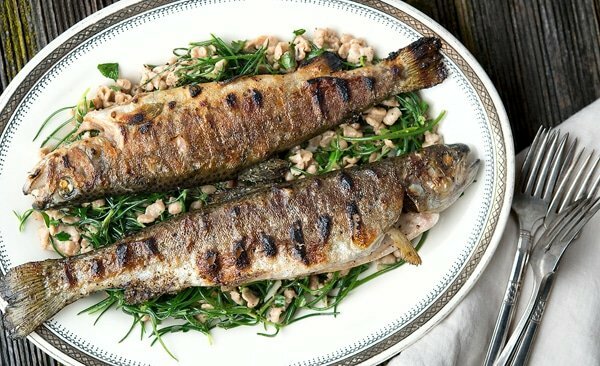 Grilling trout isn’t rocket science, but you do need to know a few things to keep your little fish from sticking to the grill. Gut and gill your trout. Gills impart an “off” taste to the parts of the fish surrounding them. No need to scale, as trout have tiny scales. If you are grilling a large trout, like a lake trout (mackinaw), you might want to scale it. But I don’t bother. Make sure the fish are approaching room temperature. This will ensure that they are fully cooked at the bone. One of the biggest grilling mistakes is to put ice cold fish on the grill. Doing this will often result in charred skin and raw meat where it meets the bone. Oil your fish, and your grill grates. This will really help prevent the trout from sticking. Make sure your grill grates are absolutely free of debris! You don’t need to scrub them with soap or anything, but you do need to make sure you scrub them down with the wire grill brush once they’ve heated up. You want a hot grill. This isn’t barbecue. This is grilling. High heat. Flip only once. This is vital. The trout is ready to flip when you can easily slip a thin metal spatula (I use a fish spatula) underneath it without more than one or two little places sticking. Flip and finish the cooking on the other side. Basting the trout with some butter or oil at this point really helps keep everything moist. Follow those rules and you will quickly become a trout grilling expert. Like I said, it ain’t rocket science. You can serve your grilled trout with anything, but I decided to make this a nod to the Alps, where there are lots of trout swimming around in their cold, clear lakes and streams. So I made some rye spaetzle and used a combination of sunflower and roasted pumpkinseed oil, plus some wild greens and a cool vegetable called agretti I happened to have lying around. You can use anything green. All told, this whole dinner took me about 45 minutes to make. Not a bad way to end a day on the water, eh? This method works with any whole fish. 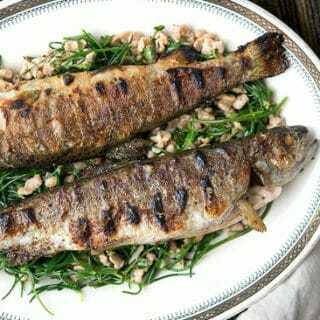 You can serve your trout however you want, but I served mine in a Northern Italian or maybe Austrian style: With rye spätzle and fresh greens, basted with roasted pumpkinseed oil. They grill in cold climates, too ya know... If you want to replicate this recipe exactly, directions are below. When making the spätzle, it really helps to have a spätzle maker, but you can use a colander with large holes, or even just flick off little bits of batter into the boiling water. You can also use little pasta, like orzo. If you are going to make the spaetzle, do them first. Mix all the ingredients together in a bowl. Bring a large pot of water to a boil and salt it well. Fill the spätzle maker with the batter, which will be goopy and sticky, and run it over the boiling water. Do this is batches, skimming off the spaetzle as they float to the top. Put the finished spaetzle onto a baking sheet and coat with a little oil. Set them aside. To grill the trout, coat them in oil and salt them well. Set them out at room temperature for 20 minutes, while you make the fire for the grill. Make very sure of two things: 1), that your grill grates are spotlessly clean -- foods stick to gunk on the grill, not the grill itself; and 2) that the grill grates are very hot. 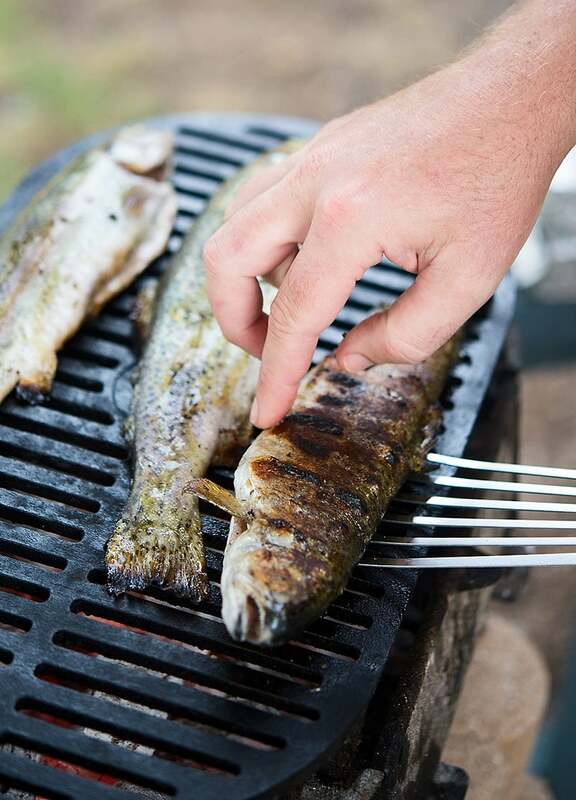 Right before you put the trout on the grill, wad up a piece of paper towel and, using tongs, wipe down the grill grates. Put the trout on the grill. Let the trout cook until they are nicely browned, even charred a little bit. How long? At least 5 minutes, and maybe up to 10, depending on how hot your grill is. As they cook, paint them with the roasted pumpkinseed oil, or some other good oil you like. Use a metal spatula -- I highly recommend using a fish spatula because they are very thin and flexible -- and test to see if the fish comes away easily from the grill. It will when it's ready. If it still wants to stick, let it cook a little longer. When you are ready to turn the fish, slip the spatula under the fish and, using your other hand to steady it, flip the trout. Do this only once. Grill on the other side until the trout comes away from the grill easily, again, about 5 to 10 minutes. When you flip the trout, start the greens in a large saute pan set over high heat. Add the chopped greens and saute for a minute or two, until they wilt. Add the spätzle and stir-fry them for a couple minutes. Turn off the heat and sprinkle salt and black pepper over them. To serve, put some of the greens and spätzle on everyone's plate, then a trout. Drizzle a little of the roasted pumpkinseed oil over everything, then splash everything with a little freshly squeezed lemon or malt vinegar. You can also butterfly your trout to remove most of the bones. 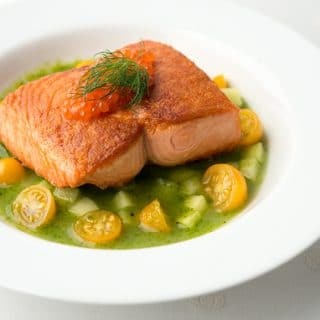 You’ll find dozens of recipes for trout and salmon here on Hunter Angler Gardener Cook! Do you eat the skin, scales and all? I love charred salmon skin but there are no scales. Ron: I do. The scales on a trout are teeny. Do you think it would turn out well to cut a fish in half lengthwise (like butterflying a chicken) and grill the halves separately. One half of the trout we got would feed the two of us so I don’t want to cook it all at once.